Visitors to Paris’ popular Place de la Madeleine, an oldy worldy haven in the French capital, more often than not head to the brightly coloured interiors of Fauchon. Here, where the signature fuchsia hues create an inviting-yet-artsy and chic atmosphere, a Parisian pâtisserie offers up a veritable treasure trove of sweet and savoury creations. Tourists and locals come for the éclairs, the cakes, the chocolates, the foie gras terrines and the freshly baked baguettes. And that’s just for starters. This is, bien sur, a French culinary institution. 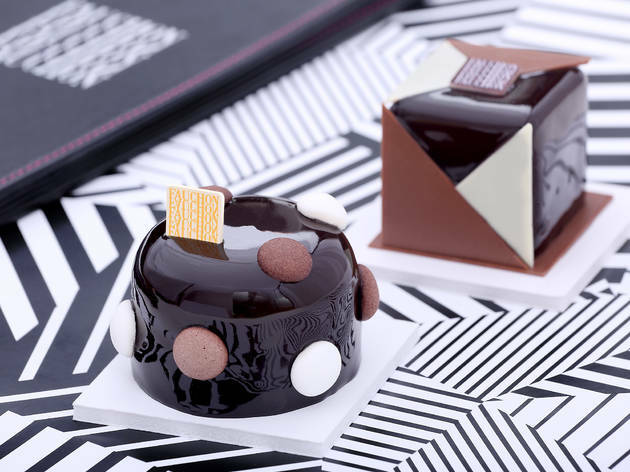 So when Fauchon opened its new Paris Le Café in Sha Tin just a few days ago, we salivated over the thought of all those gourmet Gallic delights. It’s actually a collaboration between the French confectionary brand and city restaurant group Café Deco Group, and occupies space in Sha Tin’s New Town Plaza arcade. And it’s fresh off the back of Fauchon’s other openings around Asia. Their cafés have been sprouting up in cities like Tokyo and Bangkok, so it’s no surprise that Hong Kong, with its adoration of anything French and sweet, was next on the menu. 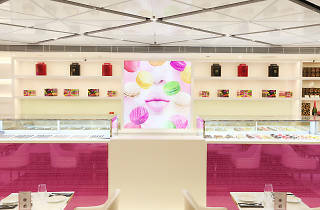 This first Fauchon Paris Le Café in Hong Kong is testament to the brand’s proud 130-year history. 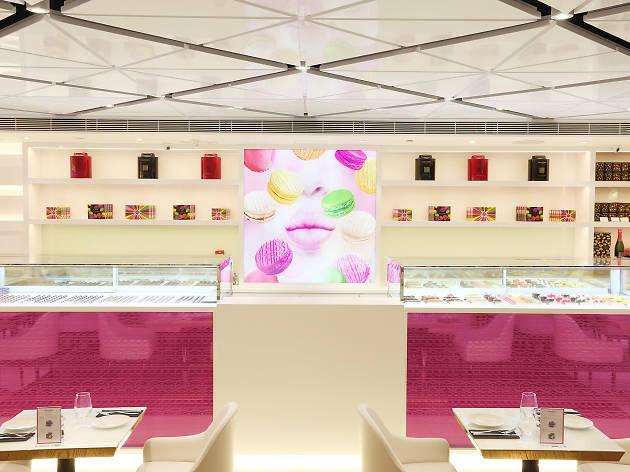 The minimalist white interiors speak volumes when it comes to French style and the deliberate focus on the dessert bar, which showcases Fauchon’s confectionary creations like cakes, macarons and éclairs, is parfait for any sweet-treat window shopper. And the ‘outside’ area of the café is also eye-catching, as it’s fashioned into a separate dining area. It’s super-comfortable and feels almost like you’re dining alfresco, despite the high ceilings of the shopping mall above. With just 116 seats, the 2,000sq ft eatery feels spacious, to say the least. Accented by Fauchon’s signature fuchsia and black colour scheme to counterbalance all the white, the café feels contemporary and chic without edging towards the cold or over-stylised. The seating is nicely spaced out and comfy plush chairs add to the whole fashionable Parisian ambiance, as do the artfully designed lightboxes of rendered artworks that feature Fauchon’s pastries. The history of the brand actually dates as far back as 1886, when founder Auguste Fauchon opened his first outlet in Place de la Madeleine. His was the first company in France to create teas that use different types of fruits and flowers, and it also immediately blazed a new trail with its elegant cakes and pastries. 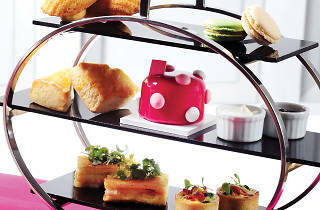 Inspired by Paris’ reputation for being a fashion capital, Fauchon has always boasted plenty of flair. 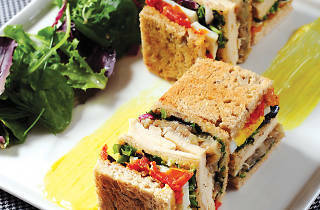 And it’s kept those traditions strong over the decades while adapting to new tastes and attitudes. 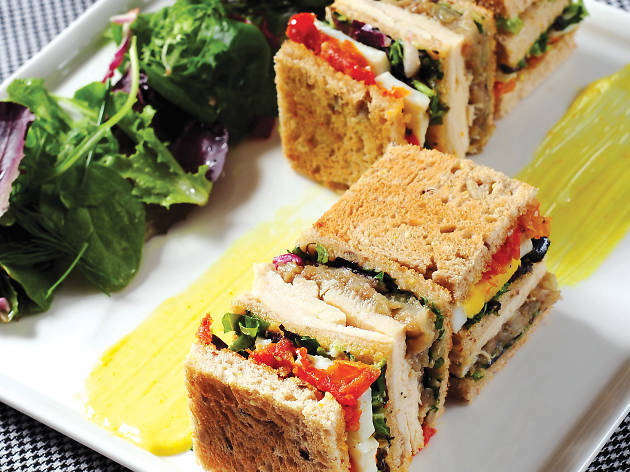 In this Sha Tin branch, the menu runs the gourmet gamut, featuring such offerings as the savoury club sandwich ($88) and the signature afternoon tea set for two ($160), which comes served on a three-tiered metal tray. 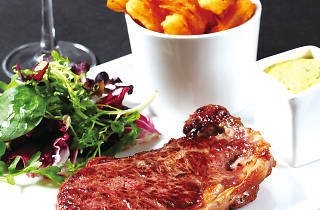 For those who are looking for something more hearty, though, there’s the sirloin steak with ‘Fauchon fries’ ($228) or the classic French onion soup ($60). The prices are pretty reasonable, appealing to the middle class crowds of Sha Tin. 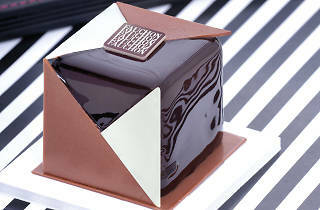 All the pastry chefs at Le Café are required to undergo rigorous training at Fauchon’s headquarters in Paris. And the high standards don’t stop there. Every tile on the floor and every ingredient in every recipe must be strictly adhered to, a standard the French house demands at all of its outlets across 44 countries. 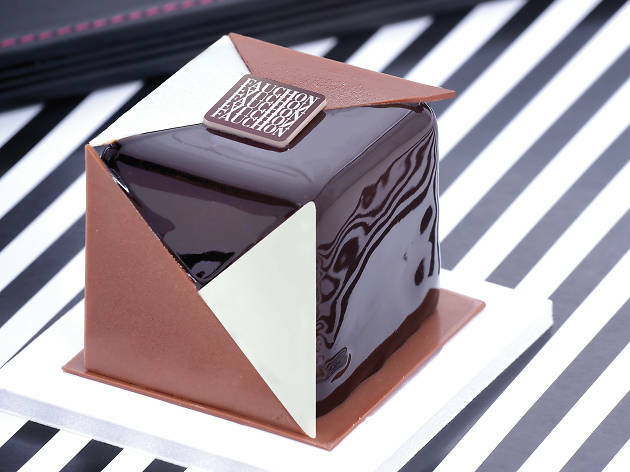 Another popular offering at the new café is its retail area, in which everything is wrapped in Fauchon’s signature black and white paper boxes and bags, all accented with fuchsia hues. Just looking at the arrangement of foie gras, packaged teas and signature Cheddar Mini crêpes at the store are droolworthy. This area is also a perfect gift shopping spot for the holidays. Look out for the beautifully packaged hampers during Christmas. 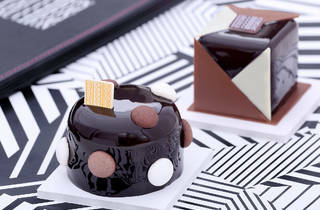 All in all, Fauchon Paris Le Café is set to be a hit with Francophiles and diners who just love exquisite sweet treats. It’s a pretty piece of Paris and, for those who don’t live there, it’s worth the trip to Sha Tin. Immediately after its opening, there were solid queues out the doors and that means, we hope, this won’t be Fauchon’s first and only branch in Hong Kong. Try it soon. When France is under the spotlight this month due to the UEFA European football championships, put Fauchon Paris Le Café under your spotlight. You won’t regret it. 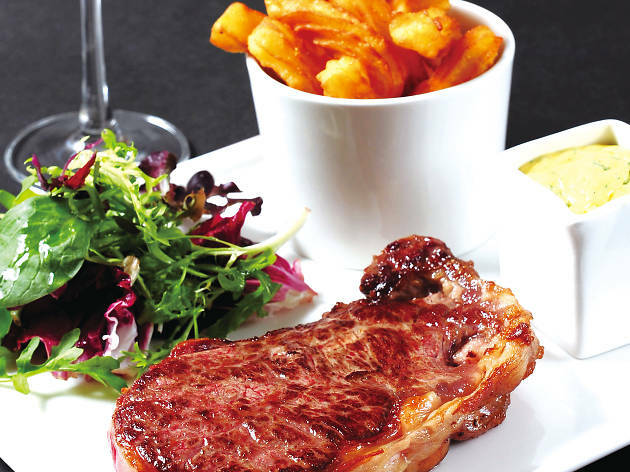 A juicy prime steak which is seared to your liking, served with a light salad and crunchy crinkle-cut fries. This is French magnificence. The chips arrive with a signature mayo dip that’s flavoured with herbs. It’s quite filling, though, so if you’re aiming to have dessert, share this with a dining companion. A stylish take on the perennial classic, the dainty square-cut club sandwiches are filled with tomatoes, lettuce, bacon and eggs. They may not look like a French artistic masterpiece to the eye but we don’t think it’s about the composition. It’s about the quality ingredients and, together, they’re sublime. The best tea set deal in town, in our opinion. The servings are generous. 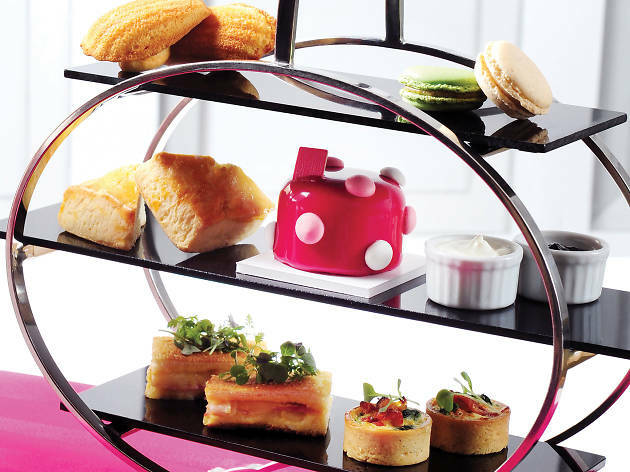 Gorge on macarons, mini-quiches, mini-croques monsieur and the chef’s choice of pastries. This version has more savoury options than other tea sets in the city, so if you skip lunch, then this is perfect to fill you and a friend up! A chocaholic’s dream come true. Don’t underestimate this small cake. It’s filled with multiple layers of chocolate mousse and has a crunchy biscuit base, as well as a chewy chocolate syrup centre. Fauchon sources its own cocoa beans to make the chocolate. Its smooth velvety texture just melts in your mouth.